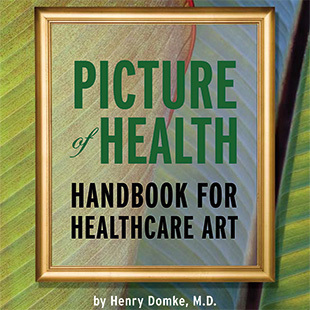 The most common art in hospitals is printed art. Since printmaking allows multiples of the same piece, the price is more likely to fit the budget. The Printed Picture by Richard Benson is a new book that traces the changing technology of printmaking from the Renaissance to the present. The book has very high quality illustrations and is written in simple English instead of art-speak. It covers all printing technologies and includes a good glossary of printing terms. I wish he did more to compare-and-contrast C-prints with inkjet prints. These are the most common form of new photographic prints one is likely to find in galleries and museums. The interesting thing that we see here is the artist’s way of hanging on to old technologies after their glory days are over. Wood-block printing, engraving, etching, lithography, and even the more basic picture-making practices of drawing and painting – all of these technologies were tremendously influential is their day, but each has moved away from the broad cultural forefront and shifted over into the narrower realm of art. This is happening now with photography: the digital methods convey a great deal of photographic description, but they don’t quite look like chemical photography, and will look less and less like the chemical forms as digital photography evolves. There will always be artists using the earlier technology in vital and effective ways, to make pictures that simply can’t be produced with the new methods. Art is like some sort of backward country where old cars are sent to be kept running indefinitely, while modern times and new models race on ahead elsewhere. 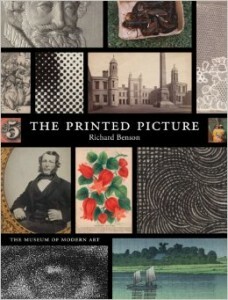 The Printed Picture by Richard Benson is available at Amazon for $37.80. The publisher is MoMA and it shows. Everything from the cover to the paper and binding is first class. Richard Benson is professor (and former chairman) at the Yale School of Art. This book accompanied an exhibit at MoMA. Their website has some multimedia material that is worth looking at. ..deeply stupid.. – that’s a wonderful turn of phrase!